Though Trinidad and Tobago remains a regional leader in the automotive sector, in the 2017/2018 period, several factors have had an impact on its performance. Firstly, the economic downturn has played a part in the car buying habits of the population. The sector has also been affected by Government’s 2017/2018 Budget, which contained several policies that directly affect both new and used car dealers. 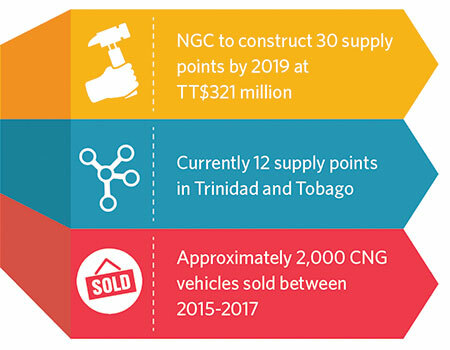 CNG transportation requires considerable infrastructural investment, which is being undertaken by the National Gas Company of Trinidad and Tobago’s CNG subsidiary, NGC CNG. In general, the country has been slow to adopt CNG vehicles. It is hoped that the budgetary incentives, along with new vehicle models and proper infrastructure will jumpstart growth. During this period, electric hybrid vehicles have been growing in popularity and in one very specific and outstanding success story, have become a profitable niche. While there are several dealers selling electric hybrid vehicles on a small scale, P&V Marketing, a Chaguanas-based dealership, has built a business offering several new and used models along with servicing and repair facilities. Nevertheless, there will continue to be strong demand for affordable, foreign-used vehicles. Local air service providers are required to have an air operator’s certificate (AOC). Currently there are five AOC holders. International airlines licences are granted through air service agreements (ASAs) between countries. Several regional countries are part of the CARICOM Multilateral Air Service Agreement (CMASA) with Trinidad and Tobago. The aviation sector is seen as high potential by analysts but faces several challenges. Aviation, like most sectors, has been affected by the economic downturn. Helicopter firms serve the energy sector, which in recent years has been hit with falling commodity prices and natural gas shortages. CAL has had difficulty with profitability for many years. In 2017, the Joint Select Committee on State Enterprises released a report on the administration and operations of the national carrier. In January 2018, it was reported that a new business interest, Tobago Airways Ltd, was seeking investors and planned on competing with CAL for the air bridge. Air travel between islands has been a persistent problem because of the enormous subsidy on the route.